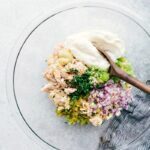 Once you’ve gotten hooked on this tuna salad recipe, you’ve got to try other reader favorite’s including this chicken salad, cucumber salad, and quinoa salad. Unlike some of the other meal prep recipes on my blog, this tuna salad is best right after it’s made. Instead of prepping it the night before, you’ll want to prep this batch the same morning you’ll be eating it. You can prep this into 3-4 containers as shown in the photos, but to add some variation I like putting it on a sandwich for a meal or two. 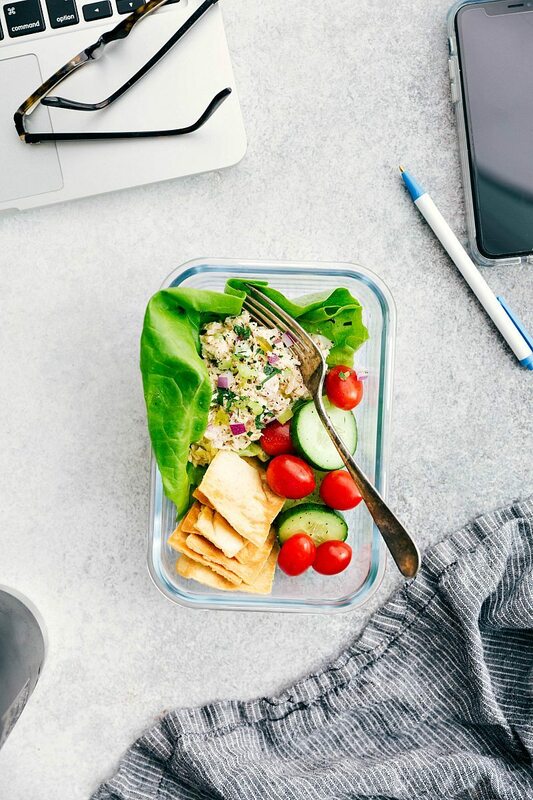 How long can you keep this meal prep tuna salad in the refrigerator? 3 to 5 days. 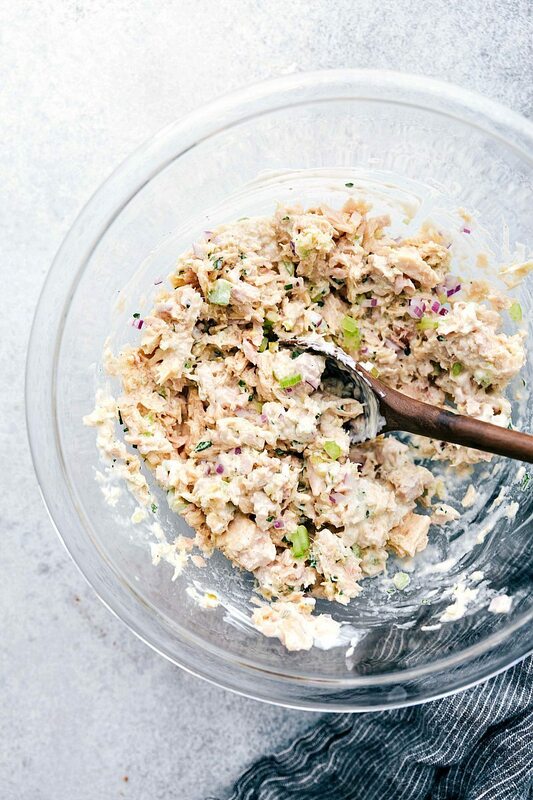 If you store the tuna salad in airtight containers in the fridge it will last 3-5 days. I usually make this Monday morning and eat it through Wednesday or Thursday for lunches. Of course, you’ll start with some good tuna. 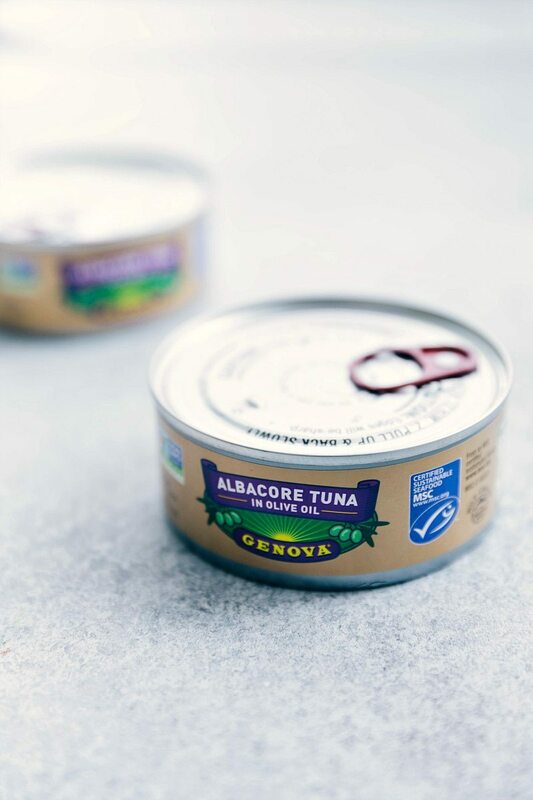 And by good tuna I mean Genova’s Albacore Tuna in Olive Oil. It is truly the BEST canned tuna. Genova’s tuna is packed in olive oil which really does make a big difference to the overall taste of this tuna salad. 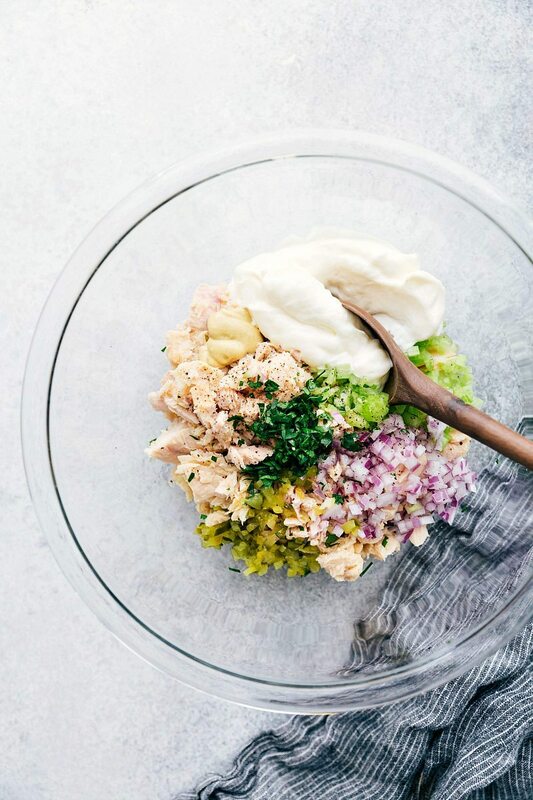 After you’ve drained the tuna, you’ll add it to a bowl with some red onion, pickle relish, freshly chopped parsley, mayo (I use an avocado-based mayo), dijon, celery, fresh lemon, a drizzle of olive oil, and salt + pepper. Toss it all together and it’s ready to go in the meal prep containers! Add whatever meal prep “sides” you want to a separate bag and enjoy with the tuna salad. 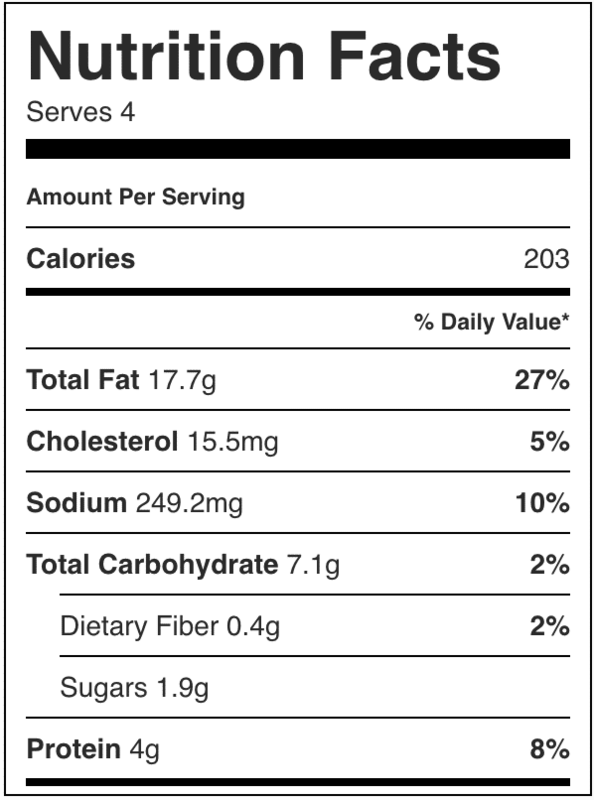 One of my go-to “sides” for this tuna salad is pita chips. I love eating them with the salad and they perfectly complement this recipe. Fresh veggies such as cherry tomatoes, sliced cucumber, sliced bell peppers, snap peas, broccoli, etc. Thoroughly drain the tuna and place in a large bowl. Add the finely chopped celery, finely chopped red onion (drained if you soaked in water), pickle relish, parsley, mayo, dijon mustard, lemon juice, olive oil, and salt + pepper to taste. Stir to combine and enjoy immediately OR separate into meal prepping containers. 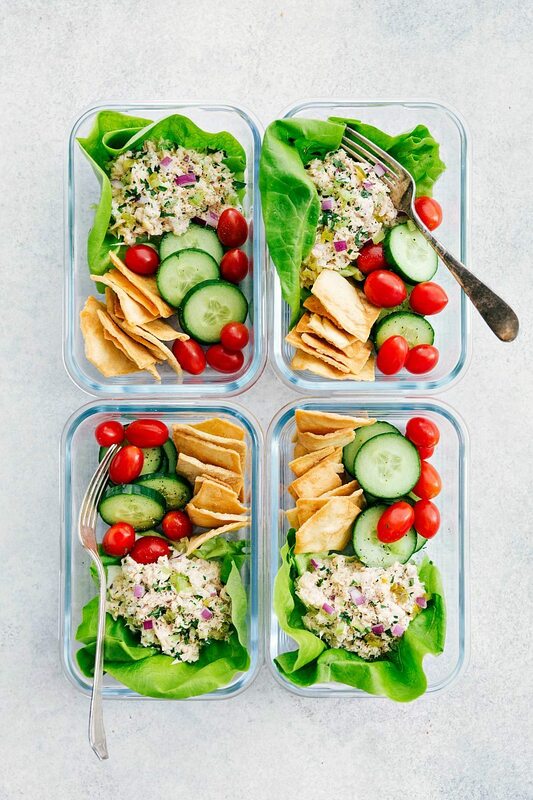 To meal prep: separate the tuna salad into 3 or 4 parts and place in airtight containers. In separate containers/bags add some sides such as fresh vegetables, fresh fruits, pita chips, whole grain bread, etc. Special thanks to Genova for sponsoring this post. As always, all opinions are my own! hey girl- this tuna salad looks oh so yummy! What is the green herb in the photo?